I don’t want to be labeled as a scrooge, but I feel a more modest celebration of Christmas is appropriate this year: my children are in their teens and we have the looming expenses of “the gap year” and university tuition fees on the horizon. I intend to create an equally beautiful, but less extravagant celebration than my family is used to. No mater how well I budget I always seem to be seduced by the “You can’t have Christmas without…” seemingly endless list of accessories: a wreath, a tree, crackers and stockings – and that is before I think about the gifts. My plan is to make some things, to sacrifice others (the advent calendars are first to go) and to choose my gifts from independent makers or independent stores. This way I hope my Christmas spend will support the community I feel passionate about. 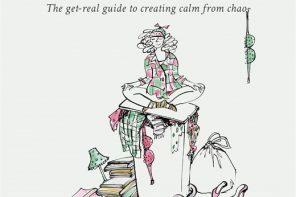 The day after Bonfire night, Christmas can seem like the domestic equivalent of Kilimanjaro. I usually start with the cards and was tempted by Alex Sickling’s contemporary Delft collection, inspired by 17th century blue and white ceramic tiles and depicting vignettes of everyday life from the Shop Floor Project in Ulverston. But I have decided instead to block print my own, using a hand-carved wooden printing block with a charming snowflake design from The Arty Crafty Place who sell a kit with the block, ink and paper for £20. 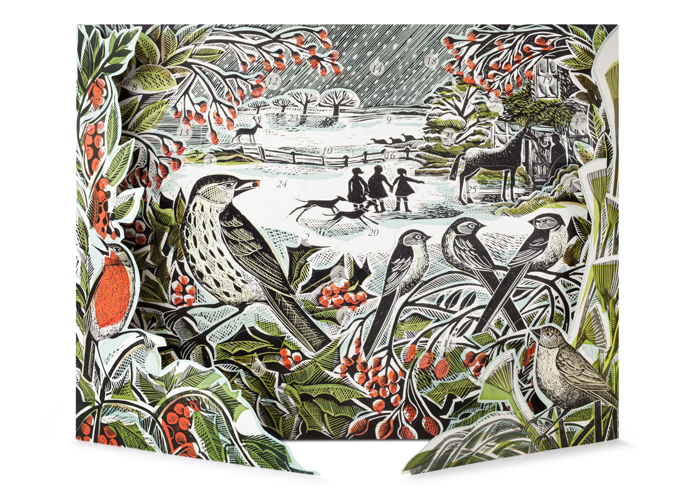 I have made the controversial decision to dispense with the advent calendar, although I am preparing for a rebellion, and, if necessary, I have a plan to buy a communal Holly Hedge Advent Calendar by Angela Harding for £9.95. 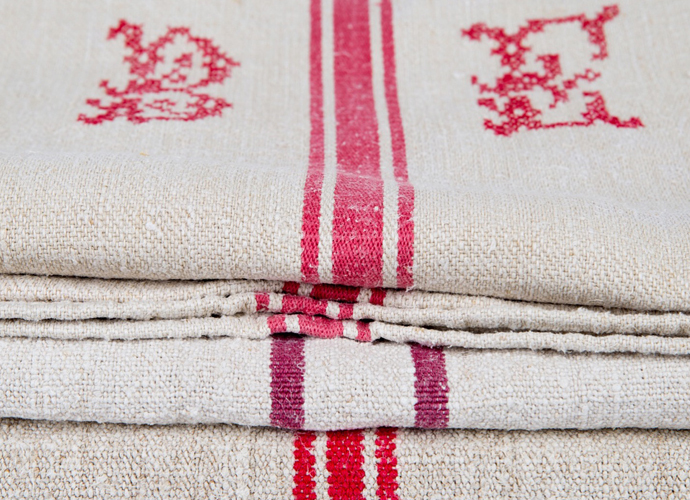 This season I have worked with No-Mad 98% India to create an exclusive table runner and four napkins set as a gift for Selvedge’s 3 year subscribers. 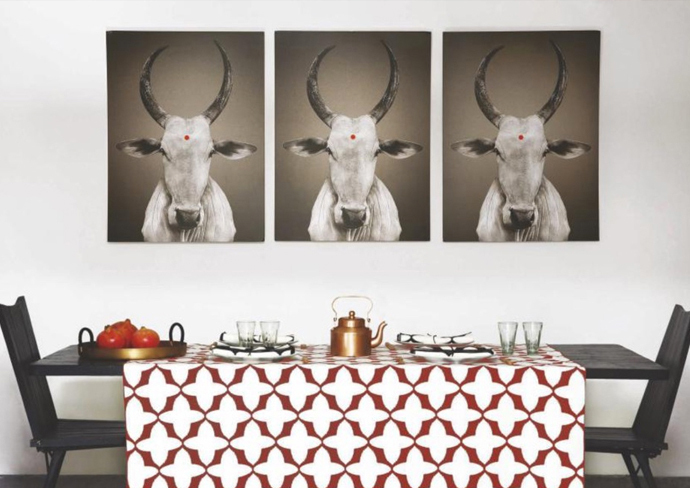 The design is made up of red stars and will make a great centrepiece, specially designed by founders Anuj Kothari and Valerie Barkowski. Luckily I have one for myself that I’ll dress my Christmas Day table with. 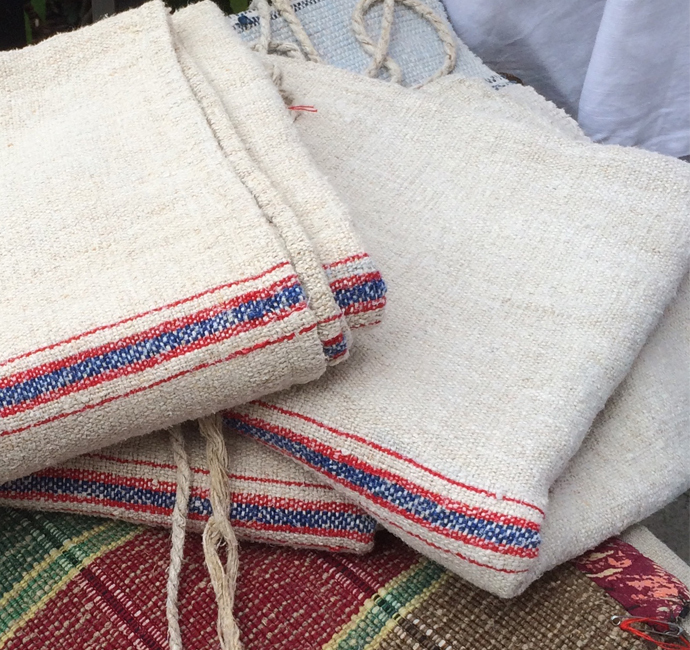 For Boxing day, I plan to repurpose one of Rebecca’s Aix’s vintage Hungarian linen grain sacks as a table dresser. I will unpick the long sides of the grain sack to reveal a piece of fabric that is 3m long. The sacks are woven on a narrow loom so each long edge has a selvedge and will not fray if the seam is unpicked carefully. 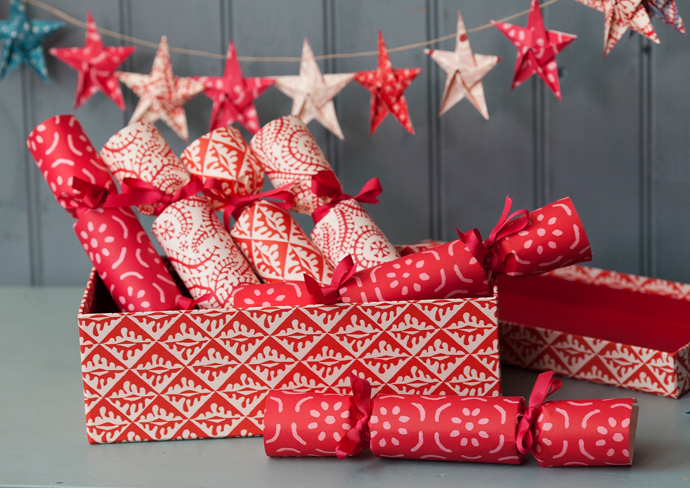 I intend to make my own crackers using Cambridge Imprint’s beautiful cracker kits, £25 (top image). I also plan to make a few short origami star garlands to hang on the back of the chairs (there are handy tutorial videos on Cambridge Imprint’s website to follow and you can take part in a workshop and make some of your own at the Selvedge Fair Bloomsbury on 2nd December). I also love their hard backed notebooks inspired by Insel-Bücherei’s low cost classics, the German equivalent of Penguin. They’re the same size as a Ladybird book, but with finer card covers, and covered with hand block-printed patterned paper. 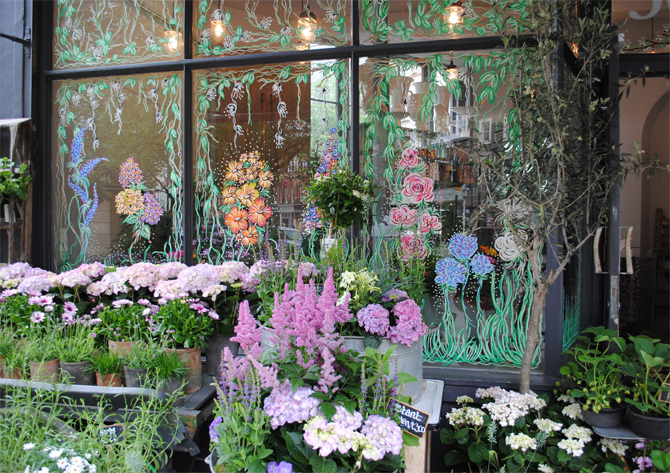 They were produced from 1912 onwards, to a high aesthetic standard. I’m planning to get a few of these for stocking fillers, £12.50. Mittens make a great gift. Not only are they seasonal, but mittens have profound significance in traditional Baltic culture. For many centuries, mittens were the most common gift and featured in social rites such as marriage. Historically young women would knit mittens to be given out to wedding guests, thought to have guaranteed a successful marriage. Even today, mittens diverse in colours and patterns are an essential part of Latvian winter clothing. 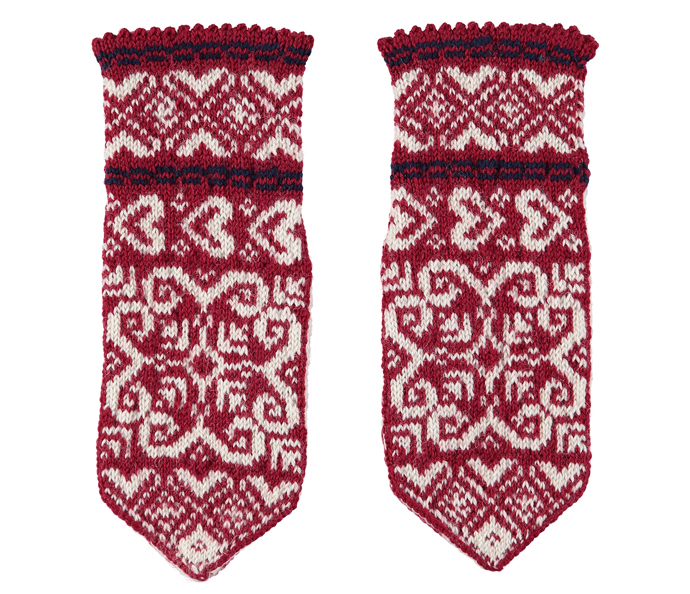 Most of the patterns featured in mittens are derived from the Latvian tradition of deities and gods. Selvedge has a range of hand knitted mittens by award winning artisan Orinta Kazėnienė, £70. Alternatively, you could give a knitting kit by Ieva Ozolina of Latvia available on Etsy £17.56. In our upcoming January issue we feature ‘Feeling Better’, an article about the benefits of knitting so you could call their kit two gifts in one, although be warned: these are not for the novice knitter. There are great traditions all across Europe and one of my favourite is the Reverse appliqué from Hungary. 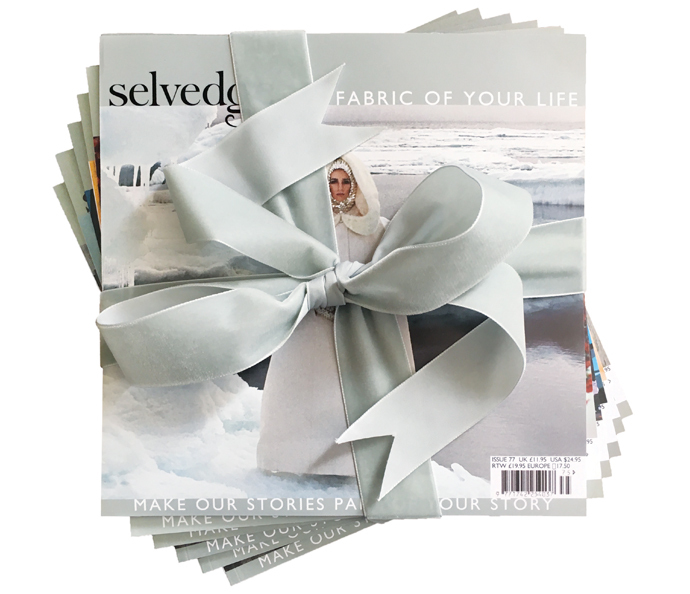 When felt is used for this technique, intricate hand-cut designs can be created, as the felt does not fray. 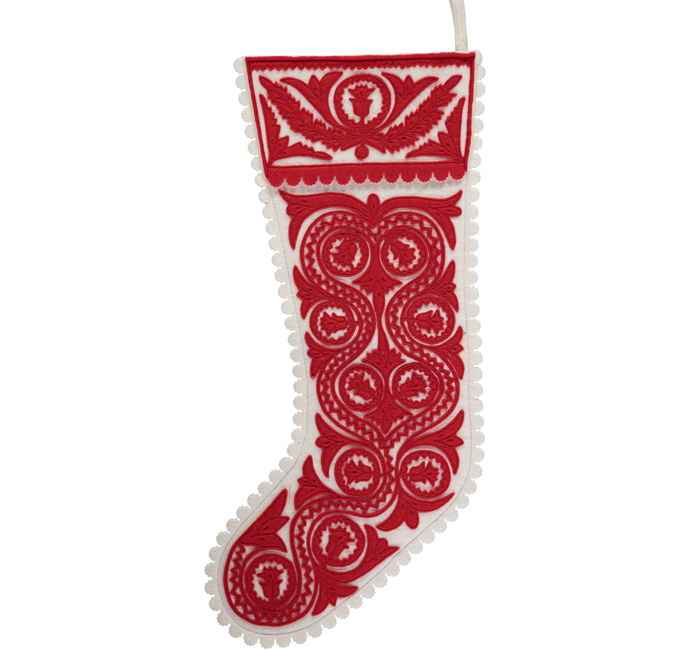 It works beautifully for a Christmas stocking and you can find a range in the Selvedge store from £75. 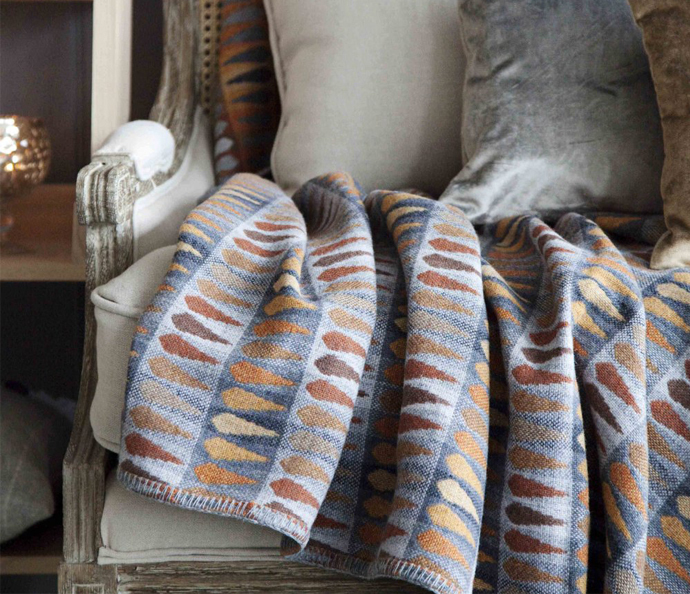 For an indulgent gift, my suggestion is a blanket by Brighton-based designer Kerry Stokes. She has enjoyed a long and illustrious career designing everything from airline upholstery to towels, and has now put her skills to good use in designing a collection of generous merino lambswool throws with neatly blanket stitched edges in a range of subtle chalky colours and designs – perfect for curling up on the sofa with a good book. Wool is great for gifts as it is so tactile and seems to sum up the season so well. It is a very British fibre too. The connection between the British Isles and wool goes back to the middle ages and it is great to celebrate this tradition at Christmas. Cecilie Telle is a designer who uses exclusively British wool to create her individually made pieces. I have one of her sack bags myself and intend to buy a Long Strap Bucket Bag, £198, in red to give as a gift. Her shapes offer minimalist design in strong colours and wonderful felt texture. All Polly’s recommendations can either be found at www.selvedge.org or at the Selvedge Fair, which takes place on Saturday 2nd December at Mary Ward House, Bloomsbury, London. My Selvedge fair ticket has not arrived yet, how can I be sure to gain entry on Saturday? Thought you would like to know that the link to Kerry Stokes is not functioning.